For use in primary or regrind circuits in mineral, chemical, or industrial pilot plants or small commercial size applications. Flexible for wet or dry grinding in open or closed circuit as a rod, ball, or pebble mill. Typical grinding applications include: copper, lead-zinc, fluorspar, uranium, molybdenum, etc. ; are processing pilot plants; high grade industrial materials to liberate values prior to recovery by subsequent processing; grinding of chemicals or material such as limestone for use as reagents. A. as a rod, ball, or pebble mill. B. in open or closed circuit with cyclone or spiral classifier. C. as a wet or dry mill. D. as an overflow, grate, or peripheral discharge mill. E. available in various lengths as shown in table. F. in a variable speed range of approximately 67% to 80% of critical speed. * Capacity based on wet grinding medium ore to 65-mesh. Shell Heavy rolled steel, bolted machined flanges template drilled with interlocking surface. Liner bolt holes and drain coupling. Standard lengths are as shown. Available 16" length sections if desired for flexibility. Liners Replaceable lifter bars with recessed bolt holes of 475 Brinnel white iron with approximately 2% Cr, 0.60% Si, 0.75 Mn, and 3.25% C. Shell liners of rubber covered steel. Liner bolts Square head standard bolts, nuts, metal and fabric reinforced rubber washers. Heads High grade ductile iron, bolted machined flanges template drilled, with interlocking surface. Trunnion surface ground and polished. 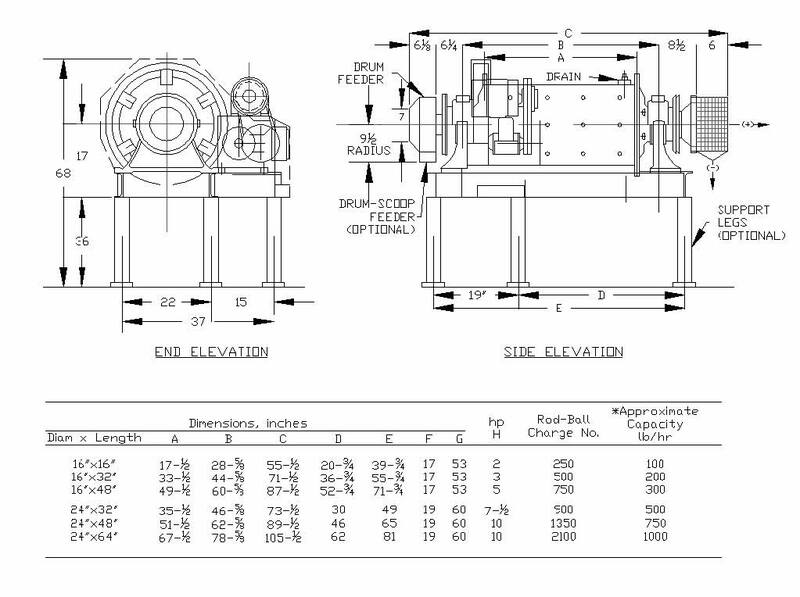 Trunnion hearings Are of babbitted construction for waste packed oil or block grease lubrication. Feeder Drum type is standard. 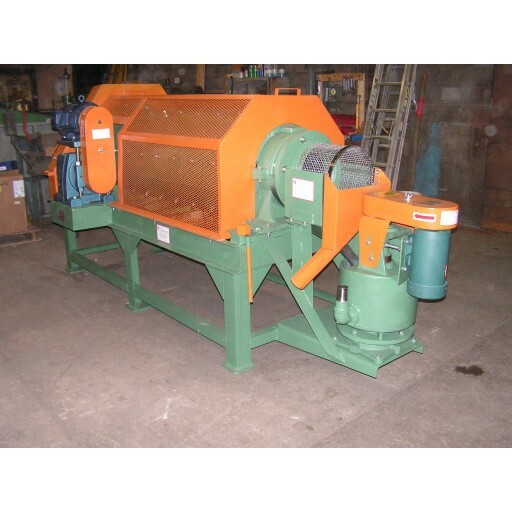 Combination drum/scoop is available (closed circuit operation). Gear Reversible cut-tooth of close grained cast iron. Template drilled and bolted to head. Gear guard Solid steel, OSHA type. Reducer Enclosed running-in-oil with double reduction. V-belt drive Vari-pitch V-belt drive with speed range approximately 68% to 80% of critical. Drive guard Solid steel, OSHA type. Motor Totally enclosed, fan cooled for 3 ph, 60 Hertz, 230/460 volt operation (or other standard). Structural base Fabricated common steel base for mounting mill and motor drive. Support legs optional. Mill discharge Trunnion overflow type is standard. Grate discharge or peripheral discharge optional.